Gonzalez, M.; Mateva, M.; Enache, R.; España-Bonet, C.; Marquez, L.; Popov, B.; Ranta, A. This paper focuses on how automatic translation techniques integrated in a patent retrieval system increase its capabilities and make possible extended features and functionalities. We describe 1) a novel methodology for natural language to SPARQL translation based on a grammar– ontology interoperability automation and a query grammar for the patents domain; 2) a devised strategy for statisticalbased translation of patents that allows to transfer semantic annotations to the target language; 3) a built-in knowledge representation infrastructure that uses multilingual semantic annotations; and 4) an online application that offers a multilingual search interface over structural knowledge databases (domain ontologies) and multilingual documents (biomedical patents) that have been automatically translated. This paper focuses on how automatic translation techniques integrated in a patent retrieval system increase its capabilities and make possible extended features and functionalities. 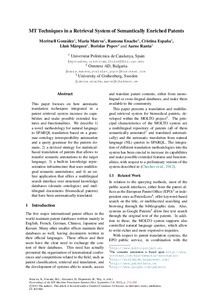 We describe 1) a novel methodology for natural language to SPARQL translation based on a grammar– ontology interoperability automation and a query grammar for the patents domain; 2) a devised strategy for statisticalbased translation of patents that allows to transfer semantic annotations to the target language; 3) a built-in knowledge representation infrastructure that uses multilingual semantic annotations; and 4) an online application that offers a multilingual search interface over structural knowledge databases (domain ontologies) and multilingual documents (biomedical patents) that have been automatically translated. Gonzalez, M. [et al.]. MT techniques in a retrieval system of semantically enriched patents. A: Machine Translation Summit. "Machine Translation Summit XIV". Nice: 2013, p. 1-8.